Candy holidays are glorious! Yes, they probably have some significant meaning to them, but itâ€™s entirely lost to me amongst seasonal candy craze. And my favorite of them all is Valentineâ€™s Day. Why? Because it is the Ã¼ber secular holiday of them all, where you are advised to give candy and kiss the people you love. Sure, you can show your love on any other holiday, but you canâ€™t really get away with walking in your underwear in public with a set of plastic wings and a bow and arrow while pretending to be cupid without drawing attention/having the police called on you? Not that I have ever done that before…. Meandering to a point, I am a sucker for candy that doubles as romantic gestures. Does the human heart look like those paper cutouts that first graders exchange with one another? Nope, but that doesnâ€™t stop me from seeing them in the store and going, â€œAww… man Iâ€™d love to give those to someone special.â€ What can I say? Iâ€™m a romantic! So when I spotted Brachâ€™s Jube Jel Cherry Hearts for a dollar at Walgreens, I felt compelled to purchase them for my special valentine. But once the candy/love spell wore off back at home, I realized I havenâ€™t had a date on Valentineâ€™s Day since I was 19. Oh well… guess that means Iâ€™ll just have to eat them all myself. 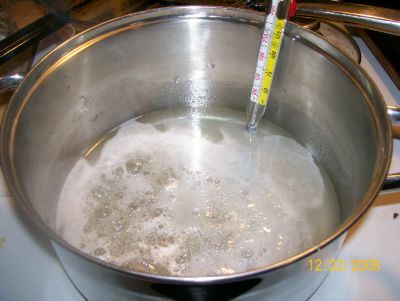 Making candy at home is a wonderful holiday activity that can become a tradition for any person, family, or group of friends. While we’ve discovered many CandyAddict.com Awesomely Addictive candies, candy you make yourself can often be tastier and more satisfying than anything you can buy in the store. You probably can’t remember the first time you bought a lollipop or a piece of fudge, but making your own candy at home is something you (and your children, if you have them) will never forget. If you’d like to make some special holiday memories by making candy this New Year’s Day, we at Candy Addict would like to share our 2008 candy recipes with you. Some of the recipes are holiday-themed, but don’t let that stop you from enjoying them. Either change them around to fit your New Year celebration or celebrate all the year’s holidays at once! Yum! From the familiar flavors of peanut butter, powdered sugar, and coconut to unusual combinations involving alcohol to the truly weird, Candy Addict has you covered. Christmas is a time of candy extravagance. Boxes of high-end chocolates line store shelves, and once-a-year goodies make their appearance. But with the state of the economy, can you afford to give your loved ones the gift of candy this holiday season? SURE you can! Because thereâ€™s one place that everyone can afford to buy candy: your friendly neighborhood dollar store! But will a gift of dollar-store candy thrill your nearest and dearestâ€¦ or only ensure that you yourself receive nothing but dollar-store gifts in forthcoming years? Find out in a special Candy Addict three-part series: It Came From The Dollar Store: The Cheapo Holiday Candy Special. Around here, the most popular dollar store is the Dollarama chain, which has yielded many Candy Addict review items over the months Iâ€™ve been writing for the site. 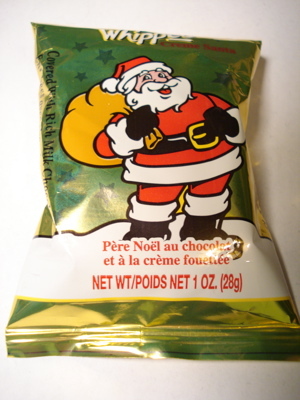 I carefully selected three items from the shelves of Christmas candy at my local Dollarama, the first of which is the Whipped Creme Santa, made by the Georgia Nut Company of Stokie, Illinois.